How Do I Create P' Charts (Laney) in Excel Using SigmaXL? P' and U' (Laney) Control Charts are attribute control charts that should be used when the subgroup/sample size is very large (i.e. > 5,000) and assumptions are not met. Typically you will see that the control limits do not “look right”, being very tight with many data points appearing to be out-of-control. This problem is also referred to as “overdispersion”. This occurs when the assumption of a Binomial distribution for defectives or Poisson distribution for defects is not valid. Individuals charts are often recommended in these cases, but Laney’s P’ and U’ charts are a preferred alternative. Laney, David B., Improved Control Charts for Attribute Data, Quality Engineering 2002;14:531–7. M A Mohammed and D Laney, Overdispersion in health care performance data: Laney’s approach, Qual. Saf. Health Care 2006;15;383-384. Open Laney – Quality Digest – Defectives.xlsx. This data is used with permission from David Laney. We will begin with the creation of a regular P-Chart for this data. 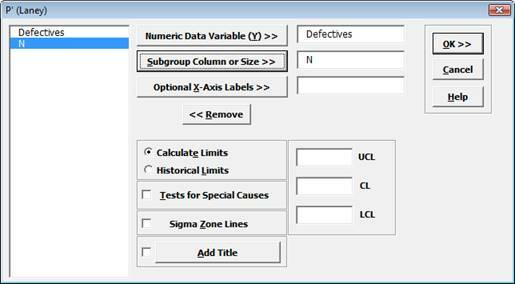 Select SigmaXL > Control Charts > Attribute Charts > P. Ensure that the entire data table is selected. If not, check Use Entire Data Table. Click Next. Select Sheet Defectives (or press F4). Click SigmaXL > Control Charts > Attribute Charts > P’ (Laney). Click Next. Since all data points are shown, dotplots are a useful alternative to Histograms, particularly when the group sample sizes are small (n < 30).